Before To Write Someting I Want To Tell You One Thing. What Economics Says? Okay I Want To Tell You Here, Human Can Not Made Any Thing Itself. They Just Can Modified From One Thing To Another Like: Carpenter Did Not Make Furniture (Chair, Table) But In Fact Carpenter Just Changed The Form Of Wood To Chair. So, He Did Not Make That. Just Change The Form One To Another. So, This Is Super Modified Cable Never Make Before. These Days, Many Android Devices Are Appearing In The Market. So, We Think This Is Also Challenging Job To The Technician To Get Success In Android Devices. We Are In Chinese Section So We Think For Chinese Devices. May Be This Cable Will Also Work For Original. Why We Need 4 In 1 Cable? Because In Market We See V3, 8600, Iphone4 And Iphone5 Types Of Android Devices Much. Why Switch In The 4 In 1 Cable? Sometimes, We Don’T Need Vcc Especially To Repair Imei Of Android Device So, When No Need, Then, You Can Switch Off The Vcc As Shown In The Picture. Sometimes Vcc Or Bsi Point Has Broken From The Charging Socket Or Earphone Socket Or Usb Socket, So We Have Added This Link To The Power Cable. And, It Is Very Hard To Fix The Other Type Of Power Cable So We Have Added 5310 Type Here. Now, You Can Work With This Cable With Nokia And Such Type Phone To Flash From Usb. 1. You Can Bring The Nokia Local Mode So That You Can Flash The Nokia Device From Usb Method Because This Cable Is Inbuilt Resistance To Bring The Device To The Local Mode. 2. You Can Also Flash The Android Devices Because Empty-Places Occupied And Joined To Gnd So That There Is No Need To Install Battery At The Flashing Time. 3. We Have Switch Of Vcc So That When The Device Doesn’T Need Vcc, Then, You Can Off Vcc From The Switch. 4. We Think Future Technology, So We Also Not Only Think 8600, V3 Types But Also We Think Iphone 4 And Iphone 5 Cables Types On It So That Future Model Can Easily Do With This Cable. 5. You Can Repair Android Imei Easily. 6. If Your Devics Has Broken Point In Of Vcc From The Socket (Charging, Earphone Or Usb Socket), You Can Also Repair Your Device Because This Cable Has Given Extra Vcc From The Wire, Not Only Vcc But Also Bsi And Gnd. I Think, Users Can Understand This. 7. As Users Know That 8600 Types Battery Socket Is Different Type And It It Difficulty To Give Powre From Cable Because At The Time Of Operation Cable Can Unplug And Device Can Be Dead So We Have Added Battery Cable For This Type Also. 8. No, Need Buy More Cables And So You Can Save Money Just Buying It. 9. No Need To But And Cut Cables For Different Types Of Mobile That Saving Your Time And Money Also. 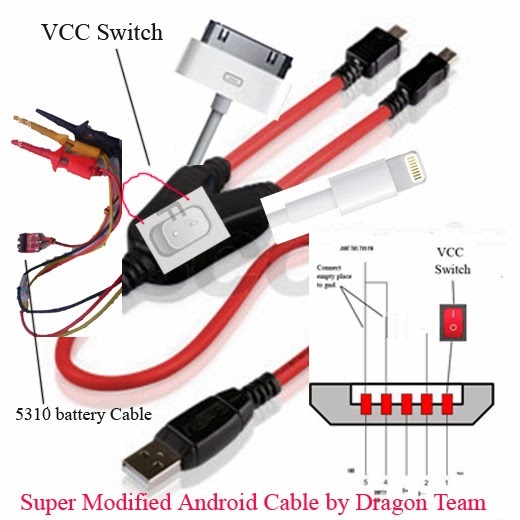 Where to purchase this cable.and which is the best flashing box for android phones??? ?